LONDON: 30 JUNE 2017 - The directors of ECR Minerals plc (the “Directors”) are pleased to announce the Company’s unaudited half-yearly results for the six months to 31 March 2017, along with an update on the Group’s activities. This report is written at an exciting time for ECR as it recommences it’s drilling activities. In the past few weeks, the Company has completed an initial drilling programme in the Byron area, the first of a number of targets planned for testing at its 100%-owned gold projects in Victoria, Australia. ECR is also looking to commence drilling at its Argentinian projects in the near future. Following the success of our recent fundraising activities, ECR is, for the first time in several years, in a strong financial position and able to look to the future with confidence. The Company’s immediate focus is on the Byron area at the Bailieston project (EL5433). A 592 m reverse circulation (RC) drilling programme was recently completed at Byron. The programme comprised 7 holes intended to target extensions to the high-grade mineralisation mined historically and intersected by drilling in the 1980s. Numerous high grade drilling results have recently been reported from the Fosterville gold mine, which is located around 30km from the Bailieston project and owned by Kirkland Lake Gold. The Costerfield gold mine owned by Mandalay Resources also lies 30km from Bailieston. With the existence of these modern producing mines in the district, the Directors believe that drilling success at Bailieston by ECR should generate a significant degree of market interest. The results of the drilling are expected to be available within the next 1-2 months. In March 2017, ECR’s wholly owned Australian subsidiary Mercator Gold Australia Pty Ltd (“MGA”) was granted a new exploration licence (EL6278) in Victoria, covering 228 square kilometres and encompassing a large number of historical hard rock and deep lead (buried alluvial) mining areas. 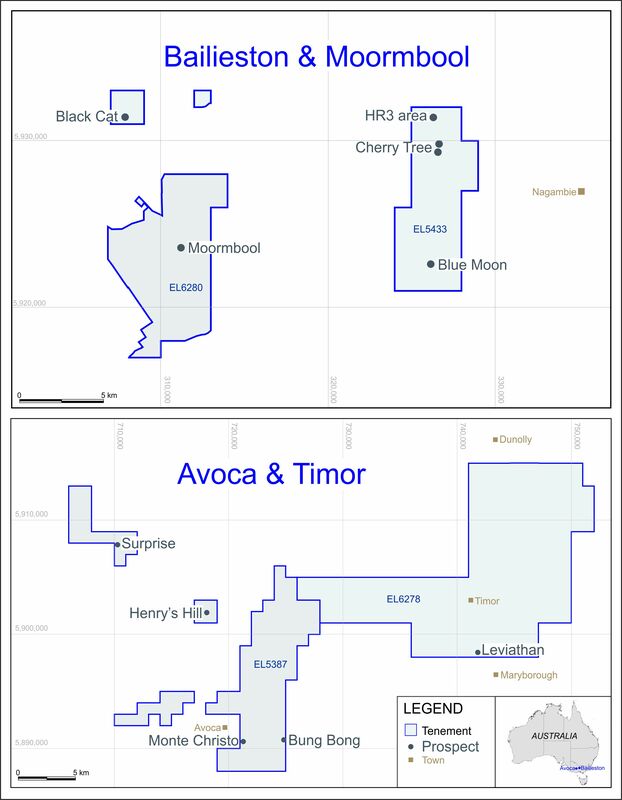 The Company’s initial strategy for this licence, which is known as the Timor project, is to use historical records and on-the-ground reconnaissance to prioritise the main exploration prospects and identify primary targets for drilling. The approval and registration of the transfer of the Avoca project licence (EL5387) from Currawong Resources to MGA is still in process, and the Company will further refine its plans for exploration at Avoca once this licence has been transferred. ECR has already identified nine initial hard-rock targets for drilling at Avoca, with deep lead gold deposits confirmed as an additional target type warranting further evaluation. Preparations have been made in recent months for drilling at the JV and El Abra prospects, after the determination of JORC Exploration Targets for these two prospects in January 2017. The preparations have included the establishment of drill pads, as well as permitting activities and liaison with the provincial government. For details of the Exploration Targets, please refer to the Company’s announcement dated 27 January 2017. A programme of approximately 2,000m of RC drilling has been designed for the JV prospect, with an additional 300m planned for El Abra. The aim of the drilling will be to enable the estimation of Mineral Resources compliant with the JORC Code for both prospects. Drilling is planned to commence in August 2017. Further to the updates announced by the Company on 24 February and 31 March 2017 in relation to the Danglay gold project, having been advised on 31 March 2017 that the board of Cordillera Tiger Gold Resources, Inc. (“CTGR”) had resolved to issue a 25% shareholding in CTGR to ECR, the Company was disappointed to become aware of a legal challenge to the issuance of the shares which has been initiated in the Philippines by Tiger International Resources, Inc. (“TGR”). As a result, ECR has not yet been issued shares in CTGR. ECR is entitled to a 25% interest in CTGR under the Earn-In & Joint Venture Agreement between the Company, CTGR and TGR, and considers TGR’s legal challenge to be without merit. ECR is in dialogue with both CTGR and TGR, and although there can be no guarantee, it is hoped that an amicable solution can be reached. In addition, Ivor Jones, a director of ECR and its Chief Operating Officer, visited the Danglay project earlier this month and following this visit, the Directors continue to believe that significant exploration potential exists at the project. An initial NI43-101 Mineral Resource was estimated for the project in December 2015, following extensive exploration carried out by ECR during 2014 and 2015. A copy of the corresponding NI43-101 technical report is available for download from the Company’s website. With the removal in May 2017 of Regina Lopez as Secretary of the Philippine Department of Environment & Natural Resources (DENR), the political outlook for the mining industry in the Philippines has improved, although uncertainty remains. In view of the disruption caused by the tenure of Ms. Lopez as DENR Secretary, it is unsurprising that the renewal of the Exploration Permit (EP) comprising the Danglay project has yet to be received by CTGR. The Directors remain of the view that the EP is likely to be renewed in due course, and ECR is ready to work with all parties to preserve the value of Danglay as a significant exploration opportunity in the prolifically gold-copper mineralised Baguio District. For the six months ended 31 March 2017 the financial statements of the Company as consolidated with its subsidiaries (the “Group”) record a total comprehensive expense of £432,339, the largest component of which is other administrative expenses of £431,492, which relate primarily to the development of the Company’s projects, but which cannot be capitalised under applicable accounting standards. The Group reported a total comprehensive expense of £533,170 for the six months ended 31 March 2016. The Group’s net assets were £2,382,561 at 31 March 2017 compared with £1,907,983 at 31 March 2016. Since the 31 March 2017, the Group’s financial position has strengthened considerably following the completion this month of an oversubscribed placing through Optiva Securities raising gross proceeds of £1,000,000 and a subscription with Shenyang Xinliaoan Machinery Co Ltd (“Shenyang”) which raised gross proceeds of £553,564. Following completion of the subscription and placing, Shenyang has a 22% shareholding in ECR, and importantly, the Shenyang shares are subject to a 12-month lock-up. The Directors are pleased to welcome Shenyang as strategic, long-term investors in ECR. ECR is a mineral exploration and development company. ECR’s wholly owned Australian subsidiary Mercator Gold Australia has 100% ownership of the Avoca, Bailieston and Timor gold projects in Victoria, Australia. ECR has earned a 25% interest in the Danglay epithermal gold project, an advanced exploration project located in a prolific gold and copper mining district in the north of the Philippines. An NI43-101 technical report was completed in respect of the Danglay project in December 2015, and is available for download from ECR’s website. ECR’s wholly owned subsidiary Ochre Mining has a 100% interest in the SLM gold project in La Rioja, Argentina. Exploration at SLM has focused on identifying small tonnage mesothermal gold deposits which may be suitable for relatively near term production. The condensed consolidated half-yearly financial statements incorporate the financial statements of the Company and its subsidiaries (the “Group”) made up to 31 March 2017. The results of the subsidiaries are consolidated from the date of acquisition, being the date on which the Company obtains control, and continues to be consolidated until the date such control ceases. These condensed half-yearly consolidated financial statements do not include all of the information required for full annual financial statements, and should be read in conjunction with the consolidated financial statements of the Group for the year ended 30 September 2016. They have been prepared in accordance with the accounting policies adopted in the last annual financial statements for the year to 30 September 2016. The report of the auditors on those accounts was unqualified and did not contain a statement under section 498(2) or (3) of the Companies Act 2006, but did include a reference to matters which the auditors drew attention to by way of emphasis without qualifying their report. The accounting policies have been applied consistently throughout the Group for the purpose of preparation of these consolidated half-yearly financial statements. The financial information in this statement does not constitute full statutory accounts within the meaning of Section 434 of the Companies Act 2006. The financial information for the six months ended 31 March 2017 and 31 March 2016 is unaudited. The comparative figures for the period ended 30 September 2016 were derived from the Group’s audited financial statements for that period as filed with the Registrar of Companies. They do not constitute the financial statements for that period. The Directors are satisfied that the Company has sufficient resources to continue its operations and to meet its commitments for the immediate future. The Group therefore continues to adopt the going concern basis in preparing its condensed half-yearly financial statements. Cash includes petty cash and cash held in bank current accounts. Cash equivalents include short-term investments that are readily convertible to known amounts of cash and which are subject to insignificant risk of changes in value. For the purpose of presenting a fair comparison the weighted number of shares in issue in previous periods has been divided by 200 to reflect the consolidation approved by shareholders on 21 November 2016. The disclosure of the diluted loss per share is the same as the basic loss per share as the conversion of share options decreases the basic loss per share thus being anti-dilutive. No charge to tax arises on the results and no deferred tax provision arises or deferred tax asset is identified. The Directors are the only key management. There were no other related party transactions during the period. On 21 November 2016 the shareholders approved a 200:1 consolidation of the ordinary share capital of the company. On 27 February 2017 the Company announced that it had conditionally raised gross proceeds of £553,564 (“Gross Proceeds”) pursuant to a subscription by the Shenyang Xinliaoan Machinery Co Ltd (“Shenyang” or the “Investor”) based in the People’s Republic of China, for 55,356,391 new ordinary shares of the Company (“Subscription Shares”) at a price of 1 pence per Subscription Share (“Subscription Price”) (the “Subscription”). Conditional on completion of the Subscription, it was agreed that the Investor would also be issued warrants over 83,034,586 new ordinary shares in total (the “Investor Warrants”). Of the Investor Warrants, 55,356,391 are exercisable at a price of 2 pence per share and 27,678,195 have an exercise price of 5 pence per share. The Subscription Shares were not issued and the Gross Proceeds were not received until after 31 March 2017. In addition to the Subscription, the directors of ECR announced that the Company had issued 6,673,021 new ordinary shares in the Company (“Ordinary Shares”) at a price of 1 pence per Ordinary Share (being the same price as the Subscription Price) in lieu of salary and fees owed to certain directors, consultants and suppliers to the Company. On 27 February 2017 the Company announced the grant of 8,153,968 share options (the “Options”) to two executive directors. The Options have been granted under the Company’s unapproved share option plan (the “Option Plan”). Each Option is exercisable to acquire one ordinary share of the Company at a price of 1.725 pence per share. The Options will remain valid, subject to the rules of the Option Plan, until the fifth anniversary of the date of grant. The Options will vest immediately. The exercise price of the Options equates to a premium of 50% to the closing mid-market price of the Company’s shares on AIM on 24 February 2017. The figures in this note for interest paid on convertible loans include the deemed cost of warrants issued with each convertible loan tranche, as well as implementation fees paid in respect of each tranche. On 26 May 2017 the Company announced the issue of 793,832 ordinary shares of the Company (the “Further Shares”) to Currawong Resources Pty Ltd (“Currawong”), the vendor of the Avoca and Bailieston projects. The Further Shares have been issued at a price of 1.8 pence, being the mid-price on AIM at the close of trading on 18 May 2017, giving them a value of £14,288.98 or approximately AUD 25,000. On 31 May 2017 the Company announced that it had received the full amount of the Gross Proceeds of £553,564 from Shenyang Xinliaoan Machinery Co Ltd, following the previously announced subscription on 27 February 2017. Completion of the Subscription and the issue of the Subscription Shares and associated Investor Warrants remains conditional upon the relevant parties entering into a relationship agreement. On 2 June 2017 the Company announced that it has raised gross proceeds of £1,000,000 by way of an oversubscribed placing (the “Placing”) for 55,555,556 new ordinary shares in the Company (the “Placing Shares”) at a price of 1.8 pence each (“Issue Price”). The net proceeds of the Placing will be used to support the ongoing activities of the Company in Australia and to explore new opportunities. On 6 June 2017 the Company announced that it has completed the subscription with Shenyang Xinliaoan Machinery Co Ltd (“Shenyang”) raising gross proceeds of £553,564 from the issue of 55,356,391 ordinary shares at a price of 1 pence per share. As a result, Shenyang was granted warrants over 83,034,586 new ordinary shares in total. Of these warrants, which are valid for five years, 55,356,391 warrants are exercisable at a price of 2 pence per share and 27,678,195 warrants have an exercise price of 5 pence per share. On 15 June 2017 the Company announced that its planned exploration drilling programme at its Bailieston licence located in Victoria, Australia has now commenced.